A new home doesn’t always require a new address. 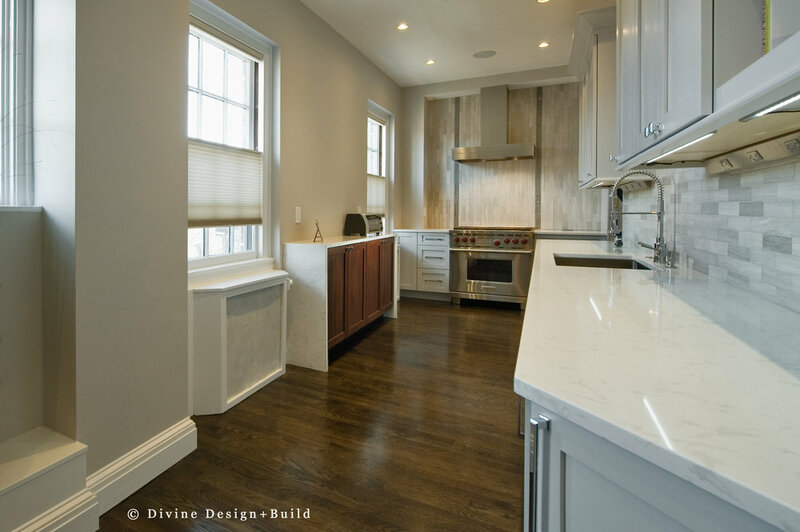 When this client considered selling his Charles Street in the heart of Beacon Hill home, he quickly realized a kitchen remodel could give him everything he wanted without the hassle or expense of relocation. The Divine team went to work on the space, giving the decades-old layout and design new life. The first step to improving the layout of the room was to relocate the previously isolated kitchen sink to a more entertaining-friendly position off the dining area and enlarging the entryway into the kitchen be eliminating many of the soffits and increasing ceiling height. Next, a small configuration change for an adjacent bathroom opened up even more options for the space. Implementing a kitchen remodel with these few adjustments created more storage as well, including a full height pantry and microwave tucked away in the food prep portion of the space. The color scheme for the design aimed to take advantage of the available natural light in the space. To make the most of the well-placed windows, gray and cherry cabinets and understated, yet sophisticated tile selections were incorporated to give a warm, natural feel. While the client wanted the look and feel of natural stone, the need to maintain a marble countertop wasn’t appealing. To address this concern, attractive engineered stone countertop was used to provide both visual appeal and carefree durability. A rich, deep stain for the hardwood floors provided contrast and balance. To complete the space and create a dramatic focal point for the design, the cooking area was updated with a professional range combination. To capitalize on the height of the space, a counter-to-ceiling tile backsplash was installed, providing a proper backdrop for the real statement of the kitchen: a stainless steel chimney range hood against a backdrop of vertical tile to further enhance the ceiling height. Using the tile as the backdrop gives the stainless steel of the professional range extra emphasis. The client loved to entertain at home, and enjoyed sharing his wine collection with family and guests. To incorporate this aspect of hosting into the design, the Divine team included built-in wine fridge in the plan. An under-cabinet wine fridge kept the collection perfectly chilled for serving, while the open shelving an adjacent cabinets provided easy access to stemware without taking the host away from conversation. Installing the built-in wine fridge close to the action allows easy access when entertaining or enjoying a quiet meal. After the kitchen remodel, the layout of the space allowed for ample pantry storage and integrated cooking solutions in the kitchen, neatly tucked away from the main entertaining space. The ample floor-to-ceiling pantry also includes a speed oven, built right into the pantry area for ease of use and clean design. Often, storage problems and flow issues can be easily dealt with during the course of a kitchen remodel.